Hollis Johnson/Business InsiderIn-N-Out has won over fans for being inexpensive and delicious. In-N-Out is beloved by fans for its low prices and impressive quality. The burger chain has kept its prices low thanks to a limited menu, in-house production, and shrewd real-estate strategy. 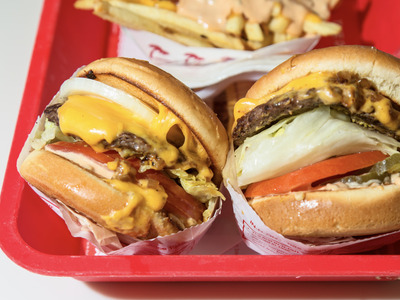 The low prices are especially notable considering In-N-Out is regularly celebrated for offering some of the best wages and benefits in the fast-food industry. In-N-Out is a burger chain unlike any other, combining price and quality in what fans consider a perfect harmony no other chain can match. The chain’s famous Double-Double costs just $US3.85. For comparison, that’s a bit more than McDonald’s Bacon McDouble, which costs around $US2, but far less than Shake Shack’s Double ShackBurger, which clocks in at around $US8. Notably, the Double-Double price hasn’t risen much in years, even with inflation and a proliferation of burger chains that seem to draw inspiration from Shake Shack’s menu. Forbes reports that in 1989, the Double-Double cost $US2.15, the equivalent of $US4.40 in current dollars taking inflation into account. So, in other words, Shake Shack has essentially lowered the cost of its burgers over the last 30 years. The low prices are especially notable considering In-N-Out is regularly celebrated for offering some of the best wages and benefits in the fast-food industry, with employee pay starting at $US13 per hour.In-N-Out Burger ranked No. 4 on Glassdoor’s list of the best places to work in 2018, beating out Google (No. 5), Lululemon (No. 6), and Microsoft (No. 39).